Improvising on the guitar requires you to have a good understanding of note relationships on the fretboard. The moment you need to start thinking about a particular note you want to play, it’s already too late. That’s why we study and practice scales, arpeggios, and chords. Another useful tool to visualize the relationship between notes on the fretboard are intervals. In this lesson, you will learn about all the different musical intervals, how they look on the guitar, and how you can practice intervals so you can use them in your solos. You can make a distinction between melodic intervals and harmonic intervals. A melodic interval is when two notes sound successive. A harmonic interval is when two notes sound simultaneous. Major intervals: 2nds (9ths), 3rds, 6ths (13ths), and 7ths. Perfect intervals: unisons, 4ths (11ths), 5ths, and octaves. When a major interval is lowered a half step, it becomes minor. When a perfect interval is lowered a half step, it becomes diminished. When a perfect interval is raised a half step, it becomes augmented. Melodic use: the repetition of a note. This is not purely theoretic though, it can be used as an effect, such as in the following example. Melodic use: used all the time, in scales etc. Harmonic use: sometimes used as an effect, as in the following example. Harmonic use: sometimes used in chords or as an effect, such as in the following example. Melodic use: used all the time, in arpeggios and chords. You can also play a scale in major and minor thirds (instead of major and minor seconds). Harmonic use: minor and major thirds can be used to harmonize melodies or as a scale for improvisation. Harmonic use: fourths are used in quartal chords, such as in So What, a popular jazz standard written by Miles Davis. The tritone is an important interval. It is the weakest interval, meaning that it has the tendency to go somewhere, it wants to move to other notes. The tritone is the main interval of dissonance in our harmony and they are the reason that dominant chords and diminished chords want to move to a tonic chord. Melodic use: The tritone is an important aspect of the Locrian mode. Harmonic use: the tritone is an important element of dominant chords, half-diminished chords and diminished 7 chords (which has 2 tritones). The tritone is also used in tritone substitution. Melodic use: you can play a scale in fifths, such as in the following example. Harmonic use: the 5th is generally something you want to avoid in your jazz voicings, it does not add much to the sound. It is often used in rock though (power chords). Melodic Use: playing scales in major an minor 6ths sounds bluesy. Minor and major 7ths are important intervals in jazz. 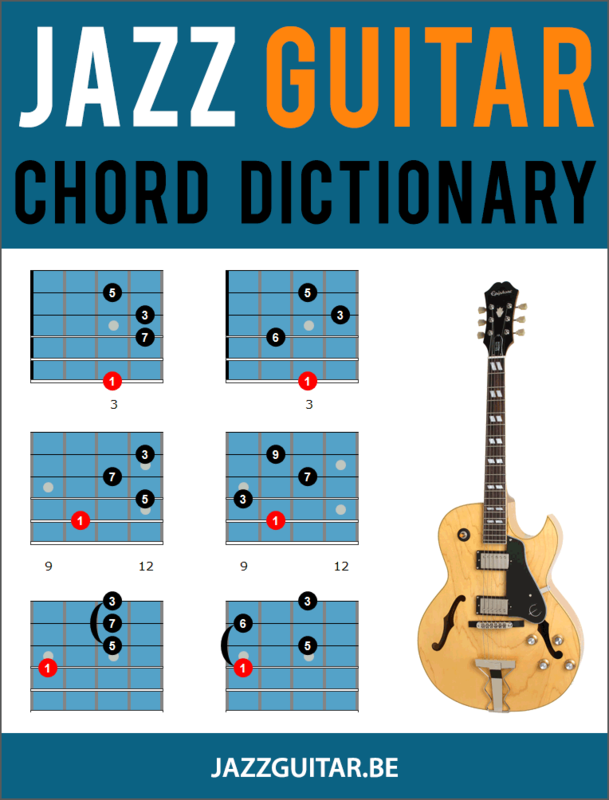 “Jazzyfying” a chord usually means adding the 7th to a triad. Harmonic use: the minor 7th is in minor 7th chords, half-diminished and dominant 7th chords. Harmonic use: the major 7th is a part of major 7th chords. The circle is round, we are back at the starting note c, but 12 half tones higher. Melodic and Harmonic Use: octaves are often used à la Wes Montgomery, in solos and themes, such as in the following example from Wes Montgomery’s standard Four on Six. The intervals we’ve seen so far are what we call “simple intervals”. There are a couple more intervals, called “compound intervals” because they go beyond the octave. We’re not going to talk about all of them, only the important ones. Use: in dominant b9 chords. Thank you. I’m enjoying this lesson, learning a bit about chord intervals gives me yet another method for getting those fingers fretted right were they will sound so right.